HarperCollins are pleased to announce a brand new, fabulous website for the current NUMBER ONE children’s bestselling author, David Walliams! We have created the World of Walliams around a street scene which includes Raj’s shop, as Raj is a consistent character through the books. 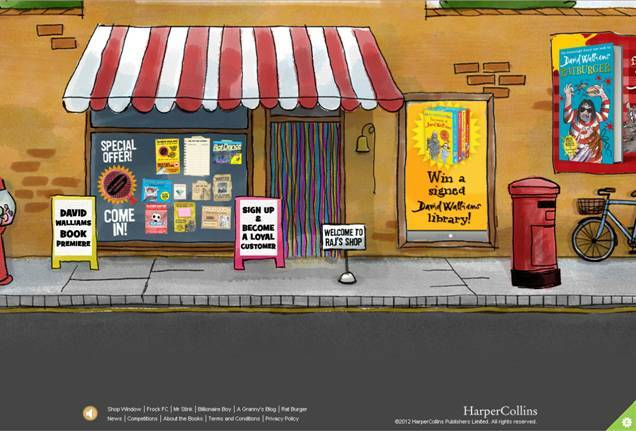 As you’ll see, we have a game per book that David has written, and if you sign in, once you have played all the games you will have a complete ‘Raj’s loyalty card’ and you win a virtual whoopee cushion which you can play as many times as you like! You can see a video of David introducing his new website here. The site holds plenty of information about David and his books, reports on past and future events, all the latest news and plenty of space for more content to come, including a Q&A facility. You can also sign up to a newsletter to get the latest Walliams information direct to your inbox. David Walliams is this week’s bestselling children’s author for the second week in a row, taking the number one spot with his hilarious and revolting new book Ratburger. The book was launched with a premiere event at Cadogan Hall two weeks ago, a film of which can be viewed here.